Not only are fire extinguishers an important part of our everyday safety, but they are a part of our history as well. Have you ever wondered how this device became the little red powerhouses that keep our home and workplaces safe? Here are the highlights of fire extinguisher development throughout history. 200 BC- Ctesibius of Alexandria fashions a hand pump designed to deliver water to fires. It replaced the cumbersome technique of passing buckets from hand-to-hand to transport water to fire. The Middle Ages– Devices called ‘squirts’ were developed which worked like bicycle p umps. These were used on the 1666 Great Fire of London. 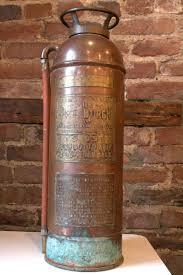 1819- Captain George Manby invents the first version of the modern portable fire extinguisher. It consisted of a copper vessel which sprayed a potassium carbonate solution using compressed air. 1912– An extinguisher model using carbon tetrachloride is mass-produced. It was suitable for liquid and electrical fires and was popular in motor vehicles for decades. However, the ingredients in this extinguisher were highly toxic, and some deaths did result in its use, particularly in small spaces. Mid-twentieth century– The modern fire extinguisher emerges, followed by various models using different ingredients. They generally use some kind of pressurized vessel to store and discharge the extinguishing agent. Fire extinguishers have come a long way and remain our best defense against fire. It is important that everyone understand how to operate a fire extinguisher and to have proper fire extinguisher inspections. Fire extinguishers are required in commercial buildings, and it is also important to be up to code with your fire prevention. If you have questions about your building’s fire extinguisher requirements or would like more information about fire extinguishers, contact Total Fire and Safety at 630-960-5060. Category: Fire Extinguishers, Fire Extinguishers, Total Fire and Safety Tags: Extinguisher, Fire Extinguisher, fire extinguisher history, firefighter history, history | Comments Off on Who Invented Fire Extinguishers?